After last week’s high with a bonus point win at home over Boroughmuir, the Greens were brought crashing back down to earth with a 78 13 thumping to Glasgow Hawks at Old Anniesland in this BT Premiership encounter. The home team’s physicality and a team including a sprinkling of BT Academy players and two Glasgow Warriors players – 105 cap Sean Lamont at full back and winger Junior Bulumaku – had far too much skill and experience for Hawick, who are still short of a few players currently injured. Hawick started brightly enough but Hawks had too much firepower in their backs and led 32-6 at half-time. Greens skipper Bruce McNeil was harshly yellow carded in the first half. Full-back Neil Renwick landed two penalty goals for Hawick in the first half. The floodgates well and truly opened in the second period and Hawks showed the potential to lift the title this season with a 14 tries scored in all. McNeil did score a try for the Greens converted by Neil Renwick. Hawick and Hawks were two play-off contenders last season, but only one of them resembled a postseason squad at Old Anniesland. “We were posted missing for about 70 minutes,” said a disappointed Hawick captain McNeil. “They had a quality side and when you come against good teams like that, playing the way we did, you get beaten. There was no fight in us and after we went 20-points down, we just lay down. Hawks featured Warriors pair Lamont and Bulumakau – Hawick listed zero professionals – but it was George Horne – younger brother of Scotland and Glasgow stand-off Peter – and Hawks younger talents that were key to shredding Hawick’s defence. 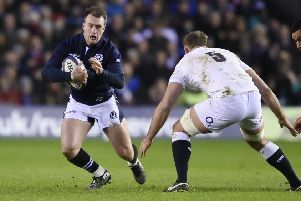 “The bottom line is that Hawick, as a town, don’t have the numbers we once had playing rugby,” added McNeil, who admits the declining playing number’s in the town is now starting to catch-up with the Greens. “We don’t have the financial muscle the city sides have to bring guys in so we suffer. The players aren’t out there for us in the town. Which means come game time we don’t have the depth and it is telling in-game. “By no means am I using this situation as an excuse for Saturday’s result. We have got what we have got and need to pick ourselves up. “It is still early in the season so we are not at the point of no return.